They are finally online the tutorial focusing on IT tools to help you to become more effective on PCM targeted to social interventions: they are a series of “how-to” video materials, a very effective method used by open source communities, which proved to be for learning ICT tools. The tutorials cover the following aspects on how to work with online drives; create accounts and familiarize with different tools; create project in management software, inviting members; use the basic functions of management tools: communication with the team, task; management, file area; create and assign tasks including feedback mechanism; create Gantt chart; create sample project budget; use the workdays timesheets; import and export data; customize working environment, filtering and sorting, setting profile and notifications; use dissemination reporting and timesheets. They are available in English with subtitles in all partner languages. It is possible to collaborate with us by giving feedback on tutorials and modules by registering on the collaborate section of the platform. All the tutorials are free and easy to use: you just have to choose the tutorial of your interest by searching through their titles; select the chosen one and watch it. To receive a constant update, please also register to the project youtube page. 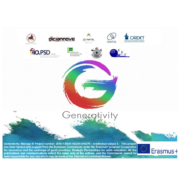 http://generativity.eu/wp-content/uploads/2016/12/tutorials.png 850 1100 teamGenerativity http://generativity.eu/wp-content/uploads/2016/12/small_logo-180x180.jpg teamGenerativity2018-01-26 12:22:262018-02-01 11:43:29Video Tutorials are online!